The deets: J.Crew pullover; Factory skirt; Zara heels; GiGee Marie clutch; Francesca's earrings; Lancome "Violette Coquette" lipstick; Michael Kors watch. This is the outfit I wore to an impromptu dinner at Chima (a Brazilian steakhouse) with one of my besties. To all my DC/VA locals - this place was FABULOUS, do yourself a favor and go (unless you are a vegetarian...it's basically a meat party) everything I tried was fantastic. Anyway - I wanted a quick way to really change up my look. All it took was parting my hair down the middle in stead of on the side, skipping eye makeup all together, and choosing a really bold purple lipstick instead of my light pink go-to. Try it and see how different you feel! 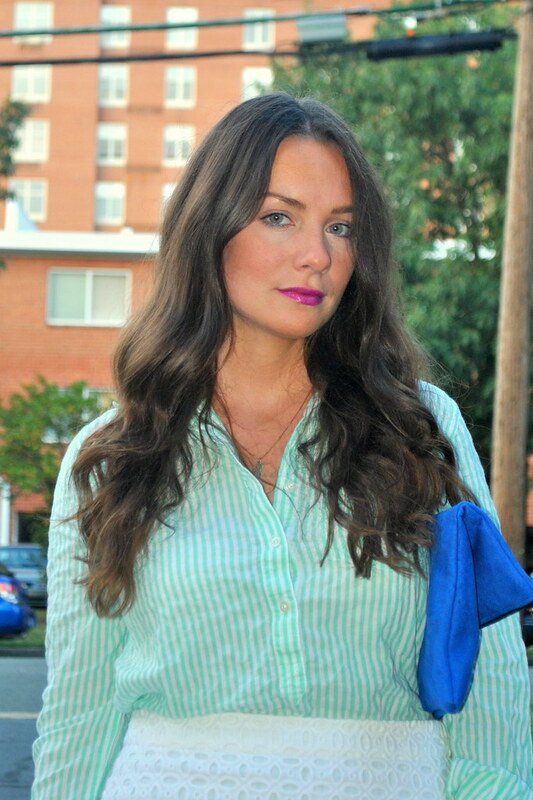 I love the mix of blue & green - and the wavy hair looks fabulous! Chima is awesome... and although all the meat is spectacular I think my fav is the cheesy bread they serve beforehand haha! So pretty adore the crochet skirt and color block heels. I know you just changed your part and lip color, but the change made me do a double take. Beautiful look!! I really like how your lipstick pop's! That skirt is absolutely amazing! Loving this outfit!! I love brazilian steakhouses! And that skirt on you is babe status. Love it! The pop of color in the shoes are gorg too.